With generic turning is covered both external and internal turning machining operations. External Cycle : The tool moves from the outside the inner part of the component. Internal cycle : The tool moves from the inner part of the component to outside. Before proceed with internal cycle is necessary create a central hole in the component. In important also use a tool with dimension compatible with this hole diameter. You can find this information in tool catalogue . To add this operation, from [MENU] -> Lathe -> External or Internal Turning , depending on your needs. 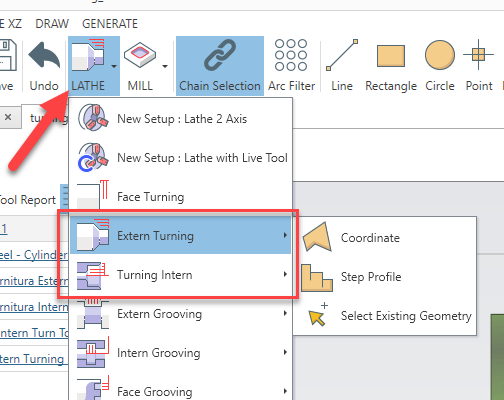 See related article on how to associate geometry to an operation, and also page about [Step Profile] and [Coordinate] pattern. They are useful with generic turning operation. Here the screen related to external / internal turning machining. 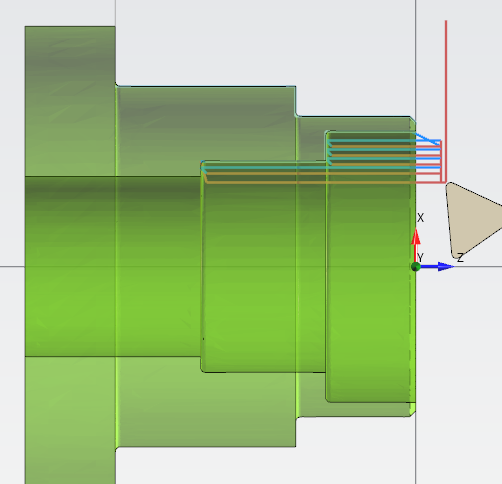 Generic turning accept as geometry both open profiles and closed profiles. It's suggested to link just a single profile in geometry list. 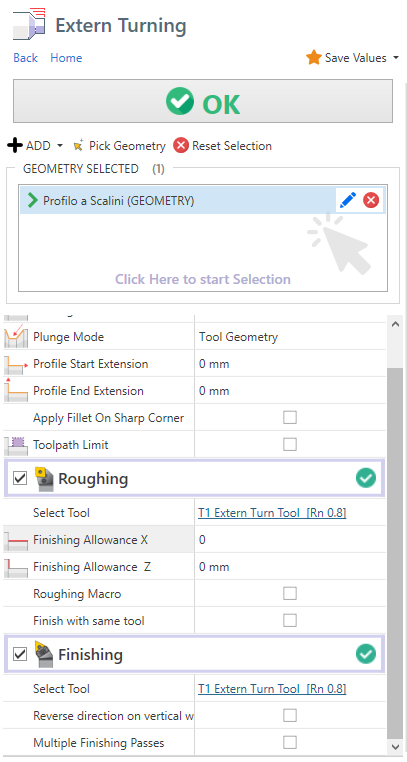 Turning direction - Reverse : Tool direction it's from Z- to Z+ , you need to select a compatible tool when you change this property. Apply Fillet on sharp corner : Where applicable, a fillet will be created in sharp corner. 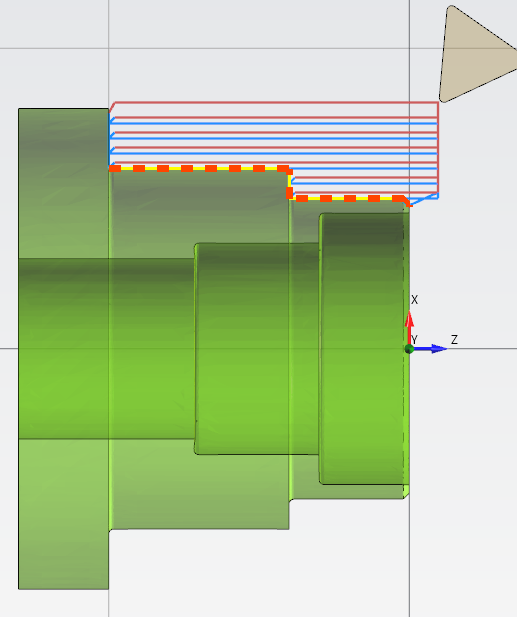 Toolpath Limit : With this you can define the limits of working area. Finish Allowance X / Z : It's the material thickness left by the roughing tool for the finishing operation. 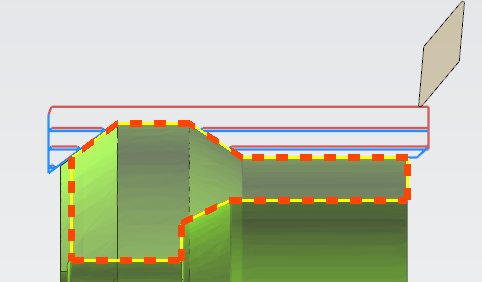 Reverse direction on vertical wall : When enable , the turning direction will be inverted in 90° profile element. In some context , this may reduce tool vibration. 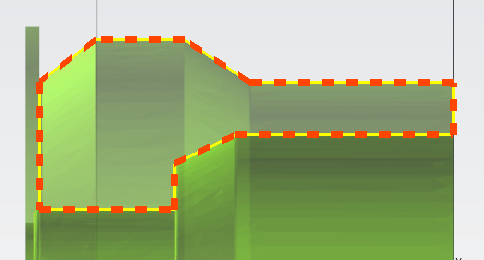 Vertical wall threshold : Will be considered only elements with length bigger than this value. Multiple finishing passes : It create multiple finishing passes. The distance between passes is determined by finishing allowance thickness. example : If you have a 0.3mm of finish allowance and 3 finish passes. 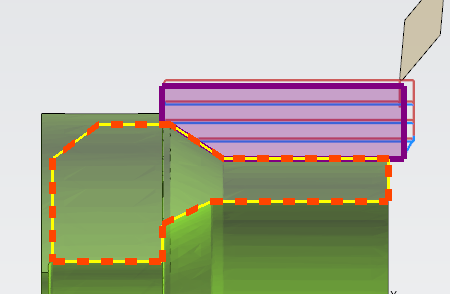 Toolpath will generate 3 passes with a 0.1mm distance between them.